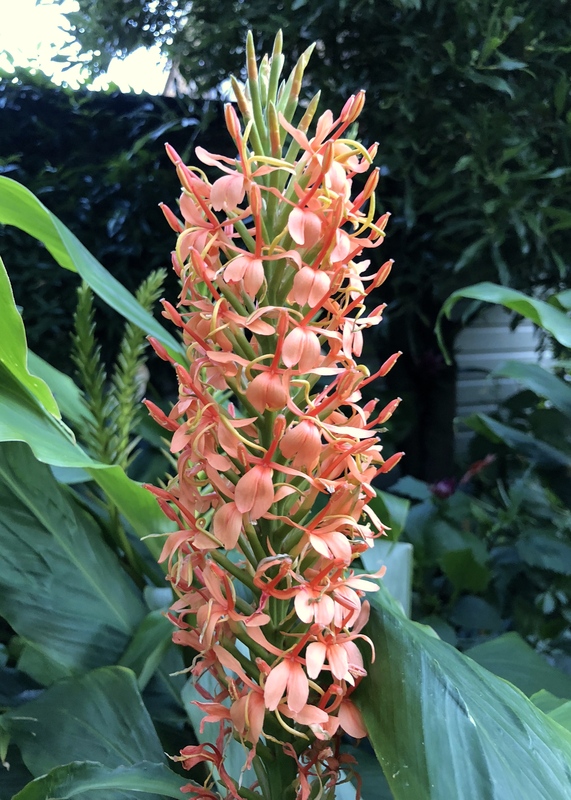 Ornamental gingers – we’ve admired them whilst on holiday in tropical countries, or seen them curated in the glasshouses of botanical gardens, but how many of us have considered growing them in our own gardens? Surely gingers need more heat and sunlight than the British climate can offer? Aren’t they going to be hopelessly needy or plagued by pests and diseases? Well, I have news for you, gingers are easy to grow, and many require a lot less care and attention than you imagine. If you don’t already grow ornamental gingers in your garden I hope that by the end of this post you’ll feel compelled to give them a try. Most gingers are easy-going, exotic-looking plants that return a lot of bang for your buck. Their demands can be summarised as regular watering and feeding, dappled shade and some winter protection; generally a deep mulch will suffice. Undisturbed in the ground they will develop into lush thickets of leafy stems, topped by colourful, highly scented flowers in late summer and autumn. 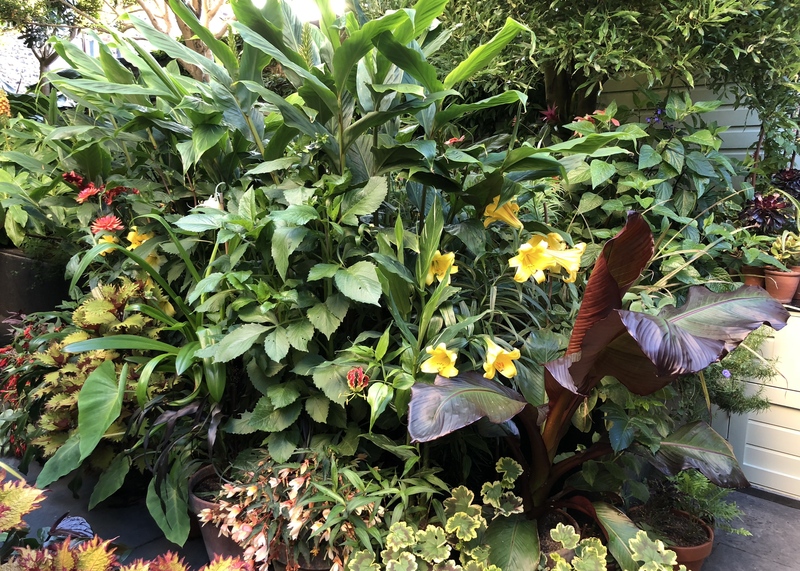 Gingers are team players, working with other plants in many situations; at the back of a herbaceous border, in a large pot in a courtyard garden, as the centrepiece for summer bedding or as part of a jungly planting scheme. Five years ago I started with a single variety, Hedychium ‘Stephen’, purchased from Hardy Exotics in Cornwall. That small plant has now expanded into eight clumps, each the size of a dustbin lid. Now I have fourteen varieties of ginger and I’m adding to them all the time. I can honestly say that gingers are the amongst easiest and most rewarding plants I grow: pest free, rarely requiring staking, always a talking point and, best of all, deliciously scented like no other plant I know. 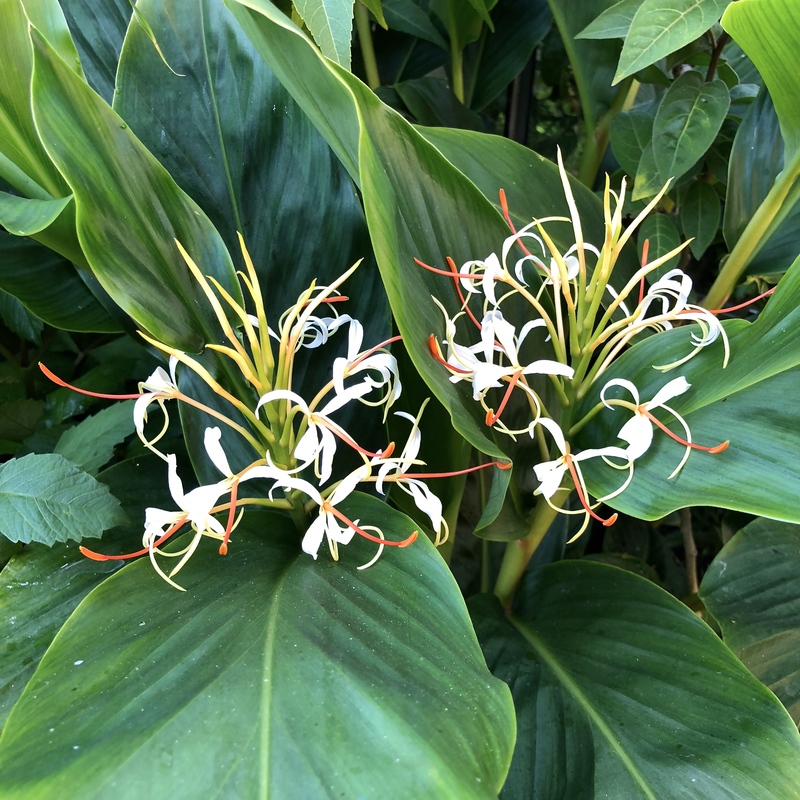 The ornamental ‘butterfly’ gingers, in latin Hedychium (heh-DIK-ee-um), belong to the Zingiberaceae family which also includes Zingiber officinale, the culinary ginger. They’re rhizomatous plants, growing from subterranean stems that look very similar to the ginger ‘root’ you’d buy in a supermarket. Most gingers grow 1-2m tall, producing long, plain green leaves on thick stems. 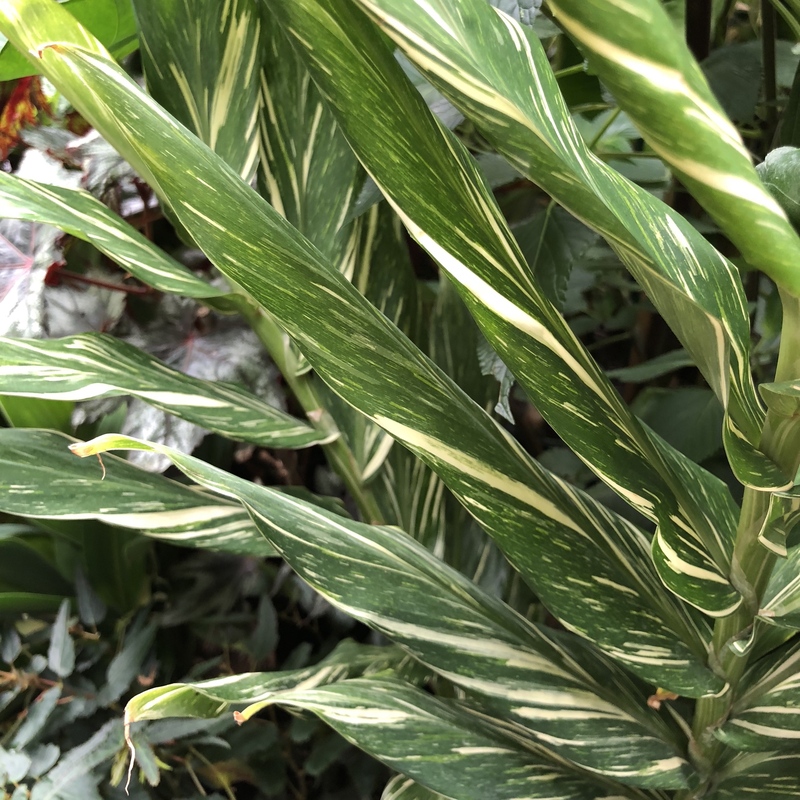 They are very hard to tell apart from their foliage, although ‘Dr Moy’ and ‘Verity’ are variegated, which is a fairly unusual trait. Ginger flowers are much more diverse, varying in size, arrangement and colour. 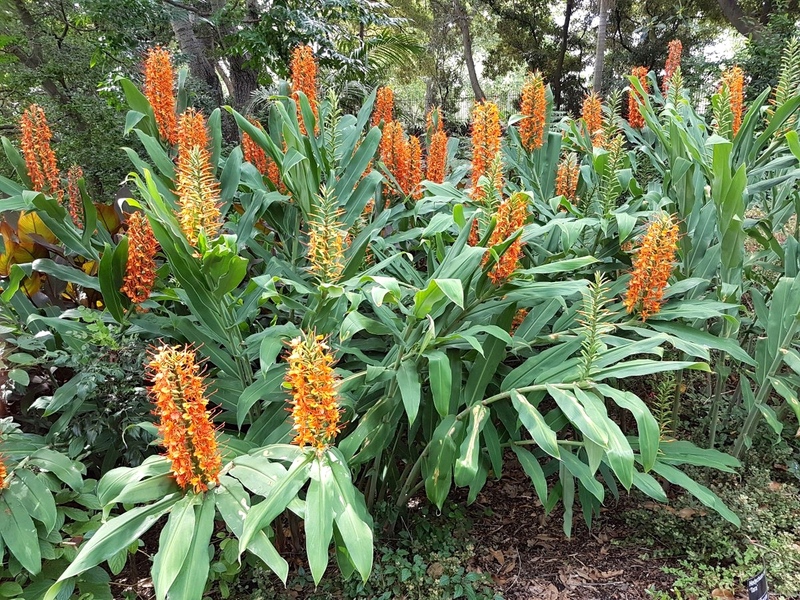 Some gingers produce a tall, candle-like inflorescence, whilst others produce a short cluster of bloom like a shaving brush. Ornamental gingers have been extensively hybridised, resulting in colours from white through yellow, apricot, orange, pink and red. 1) Gingers like to be moist during the growing season. Growing on the floor of mountain forests they are used to ample summer rainfall and rich soil. During the winter the weather is drier and the rhizomes are protected from the cold by a thick layer of leaf litter. 2) Gingers don’t appreciate hot, midday sun – in the forest the tree canopy provides dappled shade. Gingers enjoy sun at the beginning and end of the day, but not being exposed to the midday sun. In too much sun the leaves will roll up to prevent water loss through transpiration, and eventually they will develop dry, papery patches where they have, effectively, burned. Hedychiums growing happily in a sub-tropical garden. Note the stems’ arching habit. 3) Gingers enjoy a sheltered position – again, being woodlanders gingers grow best in sheltered, humid conditions. Courtyards, walled gardens and spots at the base of a wall or hedge, provided they are not too dry, are ideal for them. Gingers will take some wind, but if excessive the leaves will roll, burn and occasionally become ripped and tatty. 4) Gingers like light – The days further south in the northern hemisphere are more consistent in length and are filled with longer hours of sunlight. Outdoors during a poor British summer, some gingers may struggle to gather enough steam to produce flowers before winter arrives. Some, but not all, will die down in the winter, giving them only 6-7 months to grow and flower. Warm weather, a sheltered spot and maturity will help bring flowering forward. Buy rhizomes from reputable suppliers in April, or plants at any time during the growing season. I’ve recommended sources which I have used personally below. I’ve found gingers started from dry rhizomes much slower to establish than those purchased as growing plants. Gingers can be grown in the ground or in pots. I find those grown in pots flower earlier than those in the ground, probably because they can be started into growth a little earlier in the spring, by keeping them in a warm, sheltered spot or an unheated greenhouse. (I wonder if black plastic pots absorb heat and promote an earlier growth too.) Gingers are greedy feeders, so use John Innes No.3 in pots, and add a slow release fertiliser to the surface after 6-8 weeks. If growing in the ground, add lots of rich, well-rotted organic matter from your compost bin to mimic the woodsy conditions gingers enjoy in their natural habitat. Good compost will also retain moisture. In pots I plant rhizomes so that their tops are exposed above the surface of the compost / grit. In the ground you can plant a little deeper, but the rhizomes will tend to haul themselves up over time. If growing in pots or containers, be prepared to go up a size or two each year. Ginger rhizomes are powerful and willful quickly distorting the sides of black plastic pots; they tend to decide which direction they are growing in and then grow! More often than not I am forced to cut my gingers out of their straining containers in order to divide or repot them. I would not recommend terracotta for this reason as it will likely shatter. You can cheat in the garden by plunging potted plants into a border, but you’ll need to be prepared to feed and water your plants frequently as their roots will not be able to venture far for sustenance. As soon as thick, red, pointed shoots start to emerge from the rhizomes – which can happen any time from late April to June – then you should commence watering, unless your site is very damp naturally. Gingers will flourish close to a pond or on the banks of a stream, as at Trengwainton in Cornwall. 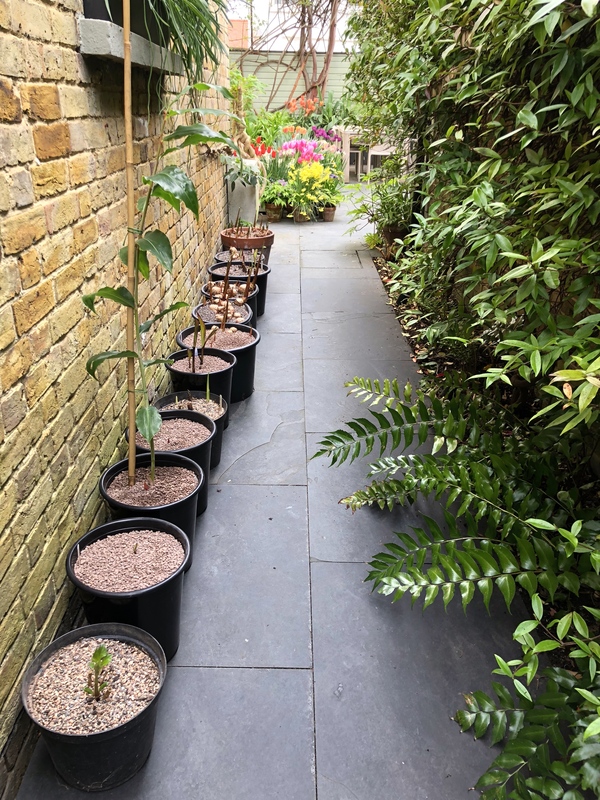 I grow 90% of my gingers in pots and stand these in a sheltered, shady passageway until they are about 3ft tall and ready to be moved into their final positions for summer. Ginger rhizomes are best divided in early summer when they are in full growth, simply by slicing them up. I use a sharp bread knife. Doing it at this time allows you to see where the new stems are and the exposed cuts will heal quickly. However, take care to avoid breaking any of the shoots in the process and don’t leave this job too late in the season. Your gardening friends will cheerfully accept any excess plants as gifts, although I find it very hard to part with them. Once growing, all gingers need are food, water, dappled shade and shelter. In warm weather they grow fast, almost in front of your eyes. I apply dilute tomato food weekly to supplement a more balanced slow-release fertiliser. Pests and diseases are mercifully few. I’ve occasionally seen a snail or a cabbage white take an interest in the foliage, but damage has been minimal. Healthy plants shrug off all but the most persistent attackers. High winds and scorching sun will be your greatest enemy, so provide shelter from those. Some gingers have the habit of throwing out stems at a slight angle, I suppose to help them search for light and spread their leaves to maximise photosynthesis. This arching habit becomes more pronounced in shadier spots. If you are fussy about this, you should stake your plants, although I feel this detracts from their natural grace and elegance. Hedychium ‘Tara’ and Hedychium gardnerianum are stronger and more upright varieties in my garden. In sun they will grow bolt upright to reduce the amount of light reaching their foliage. In the UK, most gingers will grow no more than 6″ in height outdoors, suiting most to a position at the back of the border. Following a warm spring, gingers might flower as early as late June, but most will bide their time until August, September or October. Try not to be too impatient, especially if your plants are young. Once flowering has begun each individual spike or cluster might flower for a week or so and, if scented, will emit a heavy, luxurious perfume at night. 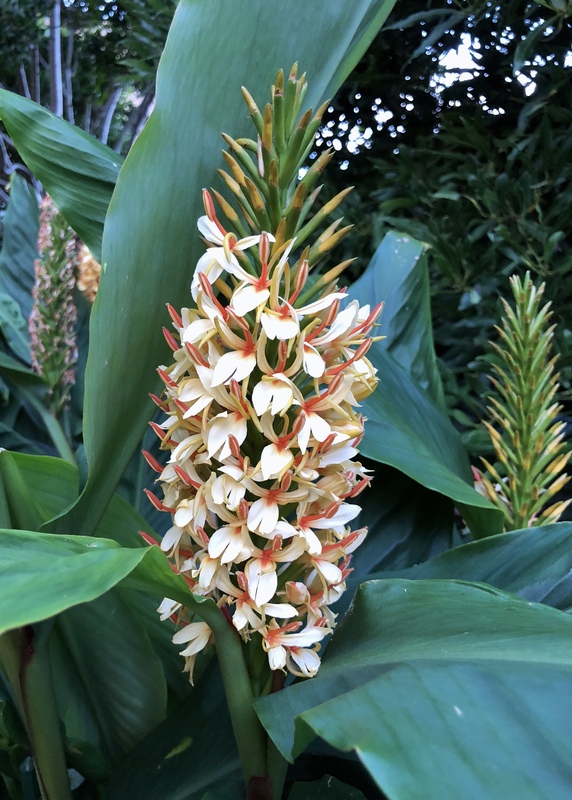 Some gingers will produce several flushes of flowers from the same spike over a period of days. 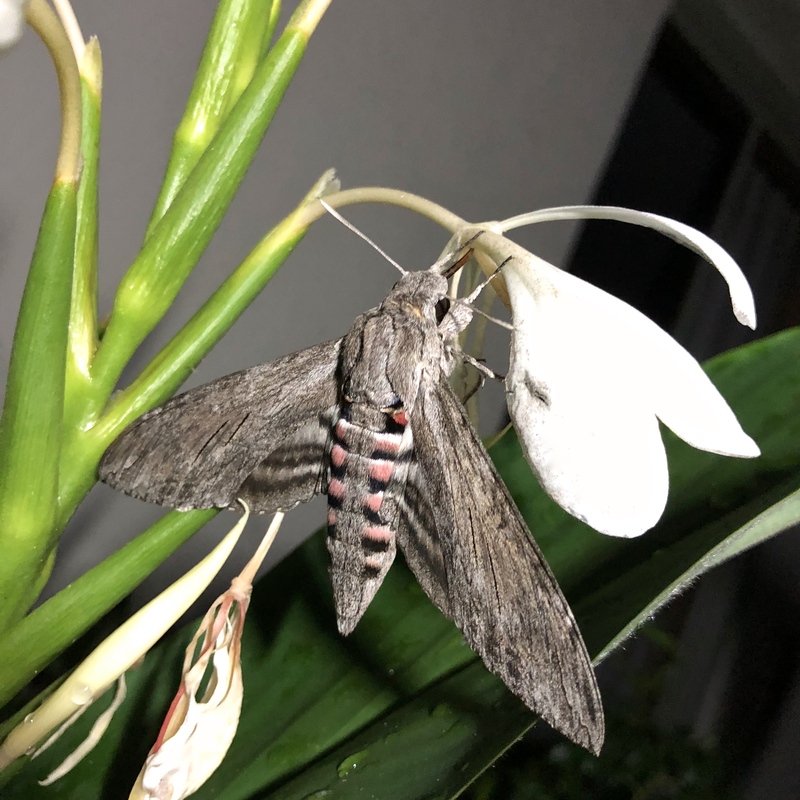 Moths like to visit, especially those with an elongated proboscis, such as the Convolvulus Hawk Moth (Agrius convolvuli). I have not tried gingers as cut flowers – I think they look better in the garden – but I don’t imagine they would last long in a vase. Once spent, there is no particular need to remove the flower spikes but this is when I stop feeding regularly. The stems on which they are held will naturally begin to decline over a period of weeks and fleshy fruits may start to appear, turning red in the late autumn. I have not attempted growing gingers from seed, but this is something I’d like to learn more about. As the first frosts approach, the foliage will start to turn yellow. At this point any gingers you want to keep growing actively overwinter should be moved into a cool greenhouse or conservatory. Those from warmer countries do not die down naturally and must be kept somewhere warm and light until spring. As the first frosts approach, the foliage of most gingers will start to turn yellow. The yellowing occurs as the plants start to pull the plant’s energy back down into the rhizome. Each dying stem will then separate quite freely from the rhizome, snapping cleanly off in a very satisfying manner: take a deep breath and fill your lungs with the fresh, gingery scent. Unflowered stems may stay green and healthy outdoors all through winter; this is certainly the case for me. Only once, in early 2018, has the temperature dropped low enough to damage any remaining top growth. No harm was done to the rhizomes. If your gingers are in pots then they can be put somewhere dark and frost-free until April. A garage, shed or cellar is fine. The rhizomes do not require any light and must not be watered. Some residual moisture in the compost is fine, but no more should be added. I do absolutely nothing to my gingers for the whole winter period, apart from checking once to ensure there’s no decay. I have yet to find any. Being greedy and vigorous, it is highly likely that the rhizomes will need repotting in a larger pot and in fresh compost every year. If simply repotting rather than dividing, I do this in April before growth begins, but do not water the plants until shoots appear. In the open ground, gingers should be given a thick mulch of leaves or bark or spent compost in November. This level of protection should be completely adequate for most varieties. If you are concerned or risk averse, dig up your rhizomes and pot them in clean, dry compost for the winter. However be aware that gingers don’t relish disturbance so are better left in situ if possible. They are great companions for spring bulbs as they start into growth so late in the year. Hedychium ‘Tara’ after The Beast from the East in March 2018. No lasting harm was done. In comparison to most other plants I grow at The Watch House, hardy or tender, gingers are a breeze. They come up, do their thing and go away again. I have never killed one, nor has a pest or disease. They are always marvelled at when I open my garden, as if I have performed some small miracle. In fact I have done very little, apart from feed and water. If I had one criticism it would be that ginger flowers don’t last long. Growing several varieties and allowing them to make big clumps overcomes that issue by extending the flowering season and the number of flower spikes. The foliage alone is wonderful, providing a lush backdrop to other plants. There are few sights as breathtaking as a clump of gingers in full bloom, and when you add the exquisite perfume on top, there’s little to rival their exotic allure. It’s not too late to buy plants this year – if they are a decent size you may even get flowers out of them – and in November you can sling them in the shed and forget about them until spring. Easier to grow than dahlias or lilies, and more remarkable than either, ornamental gingers are a must for every garden. TFG. Jungle Seeds – the source of over half my gingers. Sadly it seems they may cease offering ginger plants at the end of 2018, so get in there quick for top-notch plants. Hardy Exotics – a plantsman’s paradise in West Cornwall. My first ginger plants came from here and I still love to visit. Urban Jungle – a great selection of gingers available via mail order. Springwood Nursery – one of the most extensive collections in the UK cultivated by a very experienced grower. The plants are quite hungry feeders and require a good feed and plenty of water when in full growth. If allowing dying back for the winter then should not be fed after the end of August. They must not be waterlogged over winter as this can be fatal for them, opposed to when in full growth the can almost be aquatic. The plants will start to grow in the spring when the average soil temperature gets above ten degrees centigrade. So I plant them with spring bulbs to give me any early flush of colour and as they fade the gingers start to grow through. The gingers will continue growth until the first frosts, and then they start to pull the energy back to the rhizome. The stem will then separate quite freely when ready and will literally ‘pop off’. If in a pot then it can be put in the garden shed for the winter or if you wish to keep them going, bring into the conservatory. 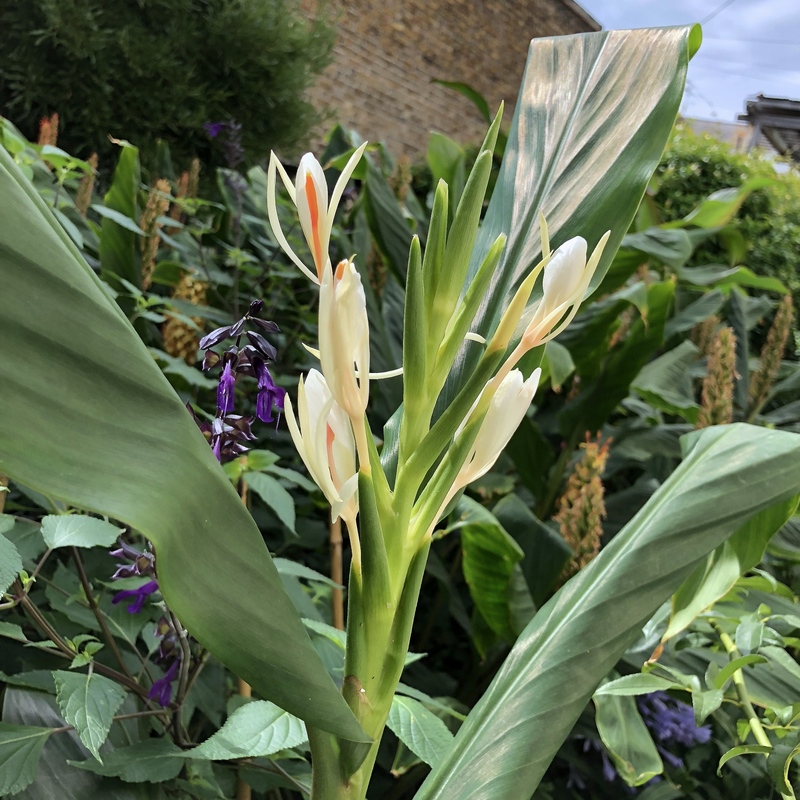 Do not lift the rhizome like you do to Cannas as they take at least a year to ‘settle in’ and so if you lift it is difficult for them to flower in the following year. The ginger rhizome is best divided in the early summer when they are in full growth, simply by slicing it up. Doing it at this time, allows you to see where the new stems are and the exposed sliced area will heal quite quickly. Late slicing as the plant slows, delays healing and can allow rots to set in. What a wonderful, inspiring, exhaustive post ! I am in awe of the care you take for your readers’ sake, and very grateful. I am definitely going to try to grow some ginger plants in the future, whether they fit in well with my other plants or not. Thank you Dan, your blog is of an unmatched quality. You are very kind to say so. I feel if a job is worth doing, it’s worth doing properly and I aim to give good advice, from personal experience. Meanwhile, I think you’ll be surprised how easily a ginger plant will slot in. Definitely one (or two,or more) for an exotic look. Your garden looked equally as impressive this year despite the best from the east. One question though, when growing plants in pots do you cover the base with broken crocs. and stuff as with annuals? Would be good to know. Many thanks. I share your doubts about the necessity of crocks. Great post Dan. ‘Stephen’ is going on my list. I grow my only specimen (H. gardnerianum) in full sun, but then we don’t get as much of that as you do! I’ve come to the realisation this year that, in fact, I’m running out of sunny spots as the trees are once again taking over. Clearly I should invest in more gingers! I couldn’t agree more with Frog above! The details you provide really are the best! Right down to sharing how to pronounce the Latin name 🤓 RHS should hire you to upgrade their descriptions lol! True! They leave a lot to be desired, however it’s a mammoth task so I can appreciate why. I think I’d get bored quite quickly!! This is a group that I do not give much though to. Those that grow here grow like weeds. I do not bother with those that do not grow here. Some of the most tropical sorts are very sensitive to cool winter weather, even though it does not get too cold here. Dan, your post was a timely reminder as to why my solitary ginger looks so sorry for itself! Putting it in a greenhouse position which gets loads of sun, forgetting to feed it properly or keeping it moist meant it’s curled up instead of flourishing. I’m now keeping your article to hand, but I do have a question; which of your 14 handles sun most readily? I want to put mine near a pond, but it’s only a few years old so doesn’t have lots of shady places. Hi Rosemary. I don’t have a heated greenhouse so it’s the garage / workshop or outside in the ground. I’ve not killed one yet …. in fact they seem very happy. I’m now completely inspired to grow a ginger plant or two! Jolly good! Let me know how you get on Jan. I had not realized that ginger lilies produced colored varieties like the ones you show here. My grandmother grew white ginger lilies from rhizomes her own grandmother had brought over from England sometime in the 1800s. Now, my sister has off shoots or cuttings from some of those rhizomes! How fantastic! That sounds like it might be H. forrestii, which is one of the hardiest here in England and was possibly popular …. and relatively new to cultivation at that time. 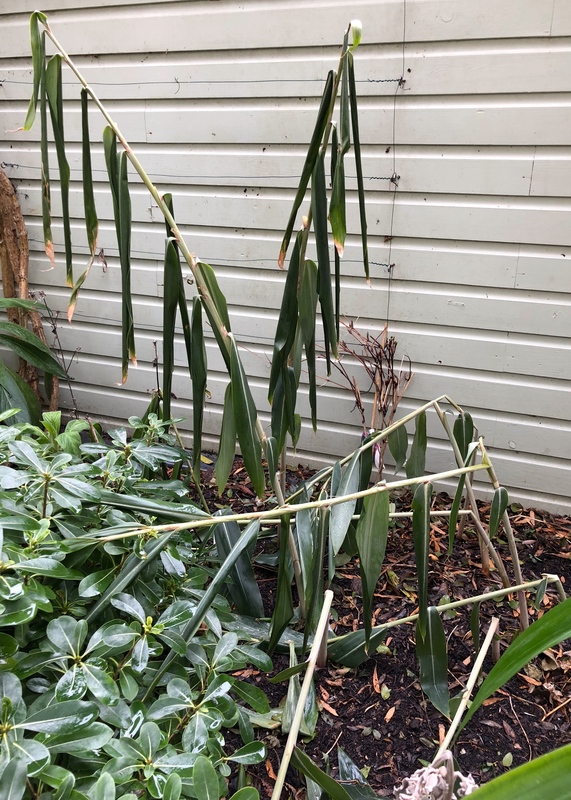 Lost all mine due to greenhouse heater malfunction last year but did buy one at Felbrigg last month no idea what variety but noticed last week a huge flower spike coming! I hope it’s gardnerianum as I love it’s fragrance! Will try to look after them better after reading your helpful post! Actually I specialised in gingers at college as part of my plant science module! You’re an expert in our midst Anne! I hope you manage to rebuild your collection. Perhaps don’t bother with the greenhouse next time and put them in a shed or garage where they can be covered with old carpet or newspaper for insulation? I do hope you got H. gardnerianum as it’s certainly one of the most impressive gingers. Mine has flower spikes forming now. Enjoy the anticipation!! Wow, such lovely blooms. I wonder where I can find gingers that I could plant here. We are in a tropical country with full sun most of the time. I suggest doing an internet search and finding somewhere local that you can go and ask for advice. They will know which gingers are best suited to your climate. Good luck! BTW What size black pots do you use? 10L, 20L? Yours look quite large. Thank you 🙏 The larger pots are 35 litres and have handles, which helps with moving them inside for winter. I buy them from Amazon. They are perfect for gingers. 35 litres? Wow! I’d never lift one of those, handles or not. Best keep any gingers I buy small. If I grow them in containers then I suppose I can move them to a sunnier spot. Or what about north-facing where I get plenty of light but no direct sun? They are heavy, I admit. However if your gingers are happy they will not remain small for long. North facing should be fine provided it’s bright shade. I have never dared divide mine and only repotted it once! So how do you know where to cut the rhizome? I will have a go next summer. I think you’ll know instinctively, but I’d divide a rhizome evenly between two growing points and at one of the junctions where it narrows. So long as it’s a clean cut with a clean knife I don’t think you can go far wrong. We all have to start somewhere and we never know it all, but it’s a rewarding process! I’ve been thinking about growing these wonderful plants but was taken aback thinking it was difficult. I’ll definitely give these a go in the very near future. Not difficult at all Ollie. In fact very easy. Much easier and more rewarding than many more common plants. Hi Sally. When they are delivered they will likely be in quite small pots. Given it’s late in the growing season I would pot them up into slightly larger pots, but not huge ones. They won’t grown a huge amount more now and you don’t want them waterlogged in winter. Then in early summer when they are growing strongly you can go up to your very large pots. As a rule it’s not a good idea to over-pot, especially when a plant isn’t actively growing. My comment on disturbance applies more to digging up from the ground than repotting, which they don’t seem to mind at all. Lucky you Sally! I can’t wait to get back to Cornwall later on this month. I miss it. Cornwall has a great climate for growing hardy gingers. Mild and damp is how they like it. You should check out The Sandy Duck, an excellent place to stay in Falmouth, and v.close to lots of hardy gingers. Ok, ok. I’m gonna try them! Oh thanks Dan this is really helpful. I spend half the year here and half in England so thinking growing one in England might be better as I’d be away in the dormant months. Yes, England might be easier. Rarely a shortage of moisture here!! In warmer climates gingers do not die down – many of mine, including H. ‘Tara’ stay green through the winter. Hope you dont mind a question. 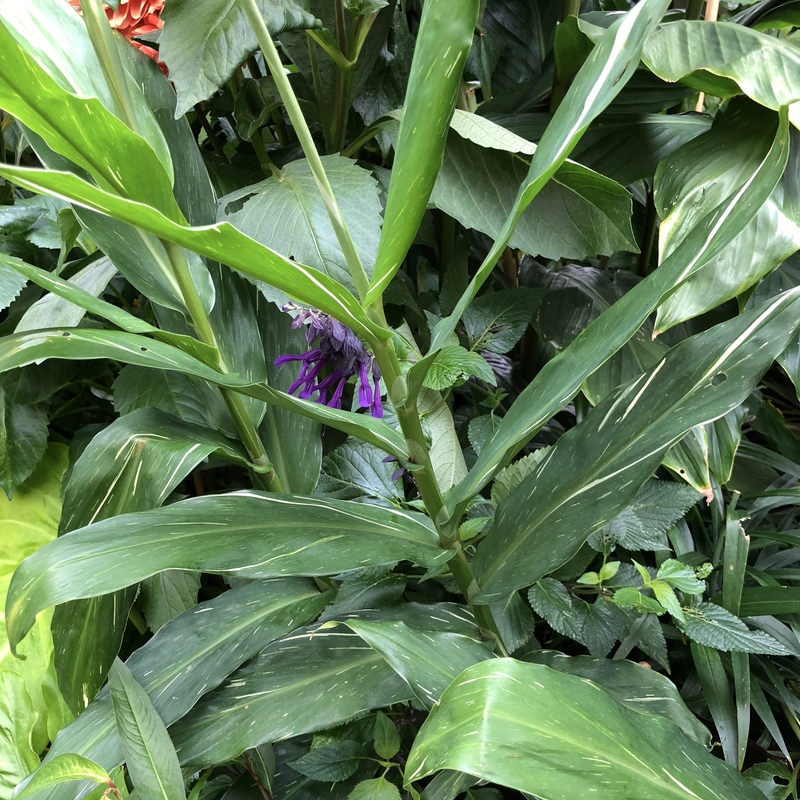 I have a large pot of I think Hedychium which overwinter in my unheated conservatory. No flowers in 2018 but a lot of growth outside last summer. No sign of the leaves dying down – shall I prune them to base level and repot next month ? The rhyzomes came back from Madeira 4 years ago and have flowered once. I live in North Norfolk. Hi Jane. My advice would be to leave unflowered stems intact. If you are lucky, they may flower this summer and earlier than they might otherwise. You will still get new shoots, and the old leaves will help to fuel their development. Add a slow-release fertiliser to your potting mix and feed regularly with a high potash liquid feed during the summer to encourage flowering. Good Luck. Hope storm Freya doesn’t give you too much trouble tonight. Thank you so much – will look forward to this summer. Freya whistled thro overnight but my tough garden survived fine. That’s good to hear. Didn’t amount to much in Broadstairs, thankfully.